Cheaters will never prosper in Halo: Reach with Bungie threatening to continually reset their progress. 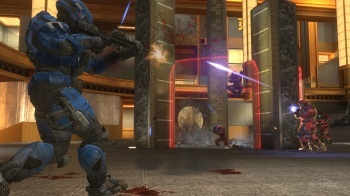 Completing challenges in Halo: Reach can net players credits used to purchase rewards, and some of those rewards require quite a bit of credits. Thousands of players have found a way to illegitimately acquire masses of this online currency, but to no avail as Bungie recently announced it'll be resetting the progress of every cheater it can find back to square one. "We are in the process of applying credit resets to approximately 15,000 users who we have identified as the most egregious Challenge Reset abusers," Bungie revealed in a forum post. In addition, these 15,000 players have earned a one-day credit earning ban. As usual when these sorts of things happen, Bungie says it has selected players for resets "carefully" so that it "avoids false positives." This situation specifically has to deal with "an exploit that allowed players to complete a Challenge 20+ times via intentional network manipulation (i.e. disconnects)." Players will apparently be losing all of their items along with the reset, as Bungie explained that the cheaters may need to re-download their pre-order or limited/legendary edition armor bonuses. This isn't close to the end of Bungie's cheater attacks either, with Bungie saying that "a more comprehensive pass" is coming next week and that it's tuning the Reach banhammer. Bungie "strongly advises" cheaters to reconsider their ways. Haven't players of online games on Xbox Live learned by now that abusing exploits and glitches will only lead them into the depths of despair?